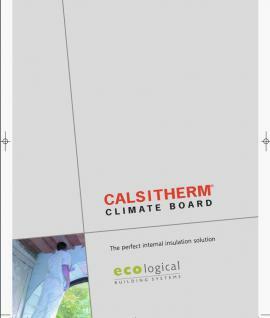 What is CALSITHERM CLIMATE BOARD? CALSITHERM CLIMATE BOARD is made from calcium silicate, a micro porous mineral building material with effective insulating properties which is highly diffusion open: the nature of the material and properties of the board ensure a comfortable living environment through its ability to regulate humidity. The high PH and molecular structure of the material means that mould growth is inhibited. CALSITHERM CLIMATE BOARD is used to insulate the internal surface of existing external masonry walls and window reveals. Insulating internally ensures that the existing external façade remains intact: this may be -40 °C to +100 °C particularly relevant in brick, stone, Listed and Heritage buildings. Can CALSITHERM CLIMATE BOARD be used in any building? It is designed for use mainly on single leaf masonry walls, for example brick or stone. It is an ideal solution to thermally upgrading and restoring buildings. CALSITHERM CLIMATE BOARD is highly capillary active, which means that it can absorb condensed water rapidly at the interface between the wall and the board, it stores it within its structure and then allows it to harmlessly disperse into the living space at a later stage helping maintain a constant humidity and ambient indoor climate. CALSITHERM CLIMATE BOARD is therefore particularly relevant for public buildings that might be subject to an increase in population over a short period of time such as museums, churches and schools. How does CALSITHERM CLIMATE BOARD inhibit mould growth in buildings? Mould can form on existing masonry walls for a number of reasons; most commonly condensation due to high humidity and insufficient ventilation; thin walls with insufficient insulation and thermal bridging, for instance, in areas where solid internal walls meet external walls and at ceiling junctions. In order to grow, mould needs an ideal temperature of around 20 °C to 24 °C, a ph-Value <6, oxygen, a nutrient (Wallpaper, glue, dust), and high levels of relative humidity due to low temperatures near the surface. Extensive tests confirm that as CALSITHERM CLIMATE BOARD is alkaline and has a PH value of > 10, mould can hardly form on its surface, making it one of the most robust insulation solutions on vulnerable walls; for instance in a basement.